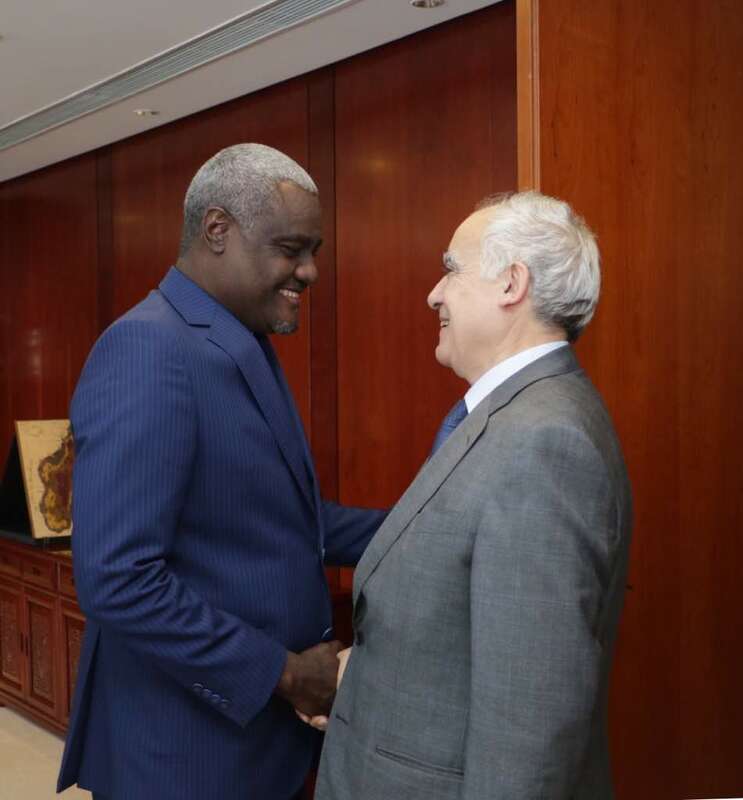 Addis Ababa,16 January 2018: The Chairperson of the African Union Commission, Moussa Faki Mahamat, received the Special Representatives of the United Nations Secretary-General and Head of the United Nations Support Mission in Libya (UNSMIL), Ghassan Salame, at the African Union Headquarters in Addis Ababa on 15 January 2018. The meeting provided an opportunity to exchange on the situation in Libya and means by which the partnership can be further strengthened in order to address the prevailing crisis in the country. Both the Chairperson of the Commission and the Special Representative underscored that a coordinated approach between the two organizations is vital in finding lasting peace in Libya. In this regard, they agreed that the two organisations shall work together to facilitate building of a consensus among Libyans, in order to unify the Libyan institutions, form an inclusive national government and hold free and fair elections in the country. In so doing, the African Union and the United Nations shall act in pursuance of the relevant decisions of the Security Council and the Peace and Security Council and build on the African Union Roadmap, adopted by the AU High Level Committee on Libya, at its 4th meeting, held in Brazzaville, on 9 September 2017, and the United Nations Action Plan adopted at the High-Level Meeting on Libya, convened by the United Nations Secretary-General, in New York on 21 Sept 2017. It should be noted that the Special Representative also met with the African Union Commissioners for Peace and Security, Political Affairs and Social Affairs in the course of which a range of issues were discussed, including efforts to address the plight of African migrants in Libya.